In addition to the flurry of TV, refrigerator, and laptop announcements at CES 2018, you could also spot the presence of several connectivity devices as well. ASUS has brought its bulky yet astonishing spaceship-like router, with an updated design and specs back to the CES show floor. And guess what, it now has a launch window as well. First shown off earlier at IFA last year, ASUS RT-AX88U router has received a spot at the company’s CES exhibit because it’s quite an attraction for visitors, especially those power users. The RT-AX88U router follows the same design aesthetics as its previous-gen brethren but has been slimmed down quite a bit. It has a black and gold paint job, which begs you to check it out at least once. But, it is not only the aesthetics of the ASUS RT-AX88U that are eye-grabbing, to say the least. The innards also pack a powerful punch and introduce a next-gen Wi-Fi standard, Wi-Fi 802.11ax, making it the first-ever router to bring ultra-fast connectivity. The speeds are said to reach a maximum of up to 6000 Mbps, theoretically. This dual-band RT-AX88U router, which features 4 antennas and 8 Gigabit ethernet ports, is expected to provide you with the highest speeds even in congested environments. This means you’ll easily be able to use your network across the complete area of your house, without any major hiccups. It brings along ASUS AiMesh WiFi technology to make the task of whole-home coverage a cinch. 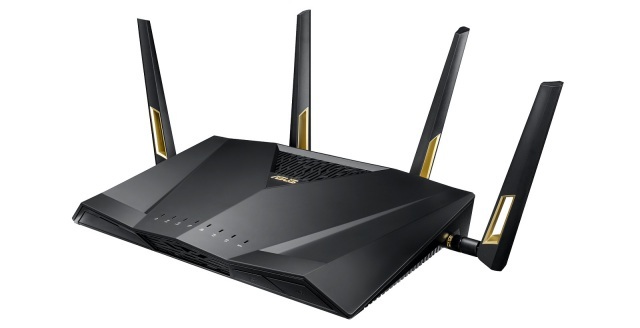 While ASUS has announced that the said router will be available for purchase in the first half of 2018, there’s still no word on the price details. Also, hardware devices compatible with the latest Wi-Fi 802.11ax standard and Gigabit speeds are currently quite limited. So, we will have to wait for all the details to be made available later this year, you can go ahead and check out all other major product launches from the CES show floor right here.